Big Life Changes – What the Heck Are We Thinking?! With only a few more weeks left of our time in Taiwan, everyone keeps asking us the same question: What are you going to do now? Our answer? Why travel, of course. If you are a fellow traveler, then you already know what we mean. It can be truly difficult to explain what ‘travel’ means to those who don’t travel long-term and have no desire to do so. And while Dan can just brush away comments like the ones listed above, I let them get under my skin, nagging and pushing at me. I feel the need to justify our plans to others; when they still don’t quite understand our definition of traveling, the self-doubt creeps in. Are our plans completely unrealistic? Is it time we return back home, find ‘real’ jobs and plan for the day we want to start a family? I know we have nothing to doubt and that traveling is the best next chapter of our lives. But that doesn’t change the fact that I’ll need a few hundred reassurances from Dan and ultimately my own inner voice to regain confidence in our plans. And if we are being completely honest here, maybe a few glasses of wine too. Yes. Dan and I are embarking on a period of indefinite travel. We say indefinite because we don’t have a specific plan for the places we will visit or the amount of time we will continue our nomadic lifestyle. We’re not setting any deadlines or unrealistic expectations for ourselves; rather, we’re simply traveling slowly for as long as we can, or want to—until our resources run dry or we stop enjoying what we are doing. We’re quite lucky in that we don’t have to quit our jobs, sell our house, or uproot our lifestyles dramatically. Although we settled down in Taiwan for two years, we did so as a means to live in and explore a new area of the world. In some senses, transitioning into long-term travel is quite obviously the next step to take. While we are constantly planning, we have very few concrete plans. An underlying goal for our travels is to learn how to be open to new possibilities. Not feeling the need to overanalyze and plan every small detail of our lives, but instead having faith that putting ourselves out there to pursue what we love will lead to new discoveries. In the process we’ll be traveling slowly, primarily throughout Latin America and Asia, delving deep into the local cultures. We fully intend on eating a great deal of food while we’re at it. What about working? Our futures? Like already noted, we get this one a lot. (We even contributed to a fellow blogger’s series ‘Why don’t you get a real job?’) My immediate reaction is to counter that we are in fact working our asses off. While we are traveling, we will both be freelancing, learning more about web design (in addition to about a million other interests of ours), and of course maintaining and growing our blog—something that is a lot more work than non-bloggers might realize. We also want to get back to volunteering, an element of our pre-Taiwan lives that we miss a great deal. We might even miss teaching enough to give it another go! At the end of the day, you must choose what is more responsible. Is it trailing behind what society tells you to do and remaining unhappy in the process? Or could it be following your passions and turning your dreams into a sustainable lifestyle that’s right for you? If my words aren’t inspiring enough there are about a bazillion travel quotes out there—many of which have found their way to our Pinterest boards—just waiting to push you out of your comfort zone and into the world. Do we have any reservations? You mean other than those bouts of self-doubt? Of course! We miss our friends and family back home, and there is a lot of stress and fear in letting go, allowing uncertainty to embrace you. Just because we are 110% sure that pursuing long-term travel is the right step for us, that doesn’t make it any less scary. We have no idea where we’ll be five years from now. What’s even more intimidating is that we only have a vague idea of where we’ll want to be at that point. Most of those closest to us might not believe this, but if anyone is freaking out, it’s me, not Dan. I have huge admiration for those pursuing a lifetime of travel without a constant companion. I don’t know what I would do without Dan’s daily reassurances. In our opinion, money is without a doubt the greatest barrier to starting a travel lifestyle. But it doesn’t have to be! Long-term traveling is not the same as long-term vacationing, and you might be surprised by how affordable travel can be—especially if you stick to less-expensive areas of the world. That said, we have saved a significant amount of money for the sole purpose of traveling. The goal is not to travel until the money runs out, but rather to turn our other interests into location independent careers. Enter the term digital nomad, or simply the ability to leverage the Internet to work from where we please. This is very new territory for us, so we’ll be learning as we go! What’s first on our journey? The end of September and beginning of October will find us back home for two weddings—something we are so incredibly excited for! We’re then off to explore Costa Rica for a few months before meeting up with Dan’s family for a Christmas cruise. We are hoping to have some fantastic cheap holidays abroad in 2014, but we have no plans as of yet! Volunteering with elephants in Thailand? Working on vineyards in Argentina? Housesitting in Costa Rica? We’re open to suggestions! We are so incredibly excited to finally begin a lifestyle we have been flirting with for so long. If you are new to our blog, now is a great time to connect with us on facebook or subscribe to receive new posts! We would love to have you along for our journey! Okay. We’ve talked about us long enough, something I don’t particularly like doing! Crazy for a blogger, right? Please, let’s hear from you now! Are you a traveler who non-travelers still don’t understand? Are you dreaming of a lifestyle of travel? Do you think this whole ‘I quit my job to travel the world’ is old news to most people? As always, we would love to hear your thoughts and comments! I think I’m going to use this quote, “Long-term traveling is not the same as long-term vacationing” when people start calling what we’re doing a vacation or wondering how we have the money to do it. We don’t have a lot of money (even less than what we anticipated…yikes), but we’re both survivors and will make do with what we have. This isn’t about seeing stuff, it’s about experiencing a new lifestyle. I don’t know what I’d do without Shawn’s frequent reassurances. I rarely am the one being rational and calming him down. “This isn’t about seeing stuff, it’s about experiencing a new lifestyle.” – love it!!! Thanks Carmel! You are so right that it is about experiences and not just checking attractions off of a list. I’m glad you can relate to the vacationing thing-I think that is what irks me the most! It is always so good to hear reassurances from other travel bloggers. We aren’t the only crazy souls out there! Thank you Bridgette! We feel so blessed that we will get to see everyone before jetting off again. P.S. You looked gorgeous at your wedding!! Can’t wait to hear all about it and the honeymoon! Thank you! We are pretty excited about Mexico too! Miriam, thank you so much for taking the time to leave us such a thoughtful comment. I think many people can fall into their lifestyles because of pressure or convenience rather than because it is what they are truly passionate about. It is never too late so start traveling, or following your dreams! Your encouragement truly means a lot, and it is inspiring comments like yours that keep us blogging about our travels. And I certainly agree that Dan and I have grown closer and stronger as a result of our travels together. Thanks again Miriam! I LOVE reading your blog :) Well done you guys! I think what you are doing is very brave, awesome and inspiring! Good luck for your next adventure…i look forward to following it on your blog! Thank you Kath! It means a lot to know we will have people with us along for the ride :-) Hope you continue to enjoy Taiwan! It is amazing how much money can be saved traveling when making conscious decisions about accommodation and dining. Thanks Michelle! How exciting! I can’t wait to read about this epic Vietnam bike trip. Make sure you eat lots of pho along the way! We loved our time there and the food was definitely a highlight. Happy travels! One thing I’ve realized since we left our old life to travel is how for most people, doing something simply because you want to or it would make you happy isn’t viewed as a reasonable justification. You’d think everyone would be out there chasing their bliss, trying to fill their lives with all the things that make them smile, make them think, make them look forward to getting out of bed in the morning. But the truth is that most people don’t do this. They believe that it’s better to lead a safe, conventional life, where you get 2 – 4 weeks of happiness doled out when your boss says so and that’s that. I’m not saying a lot of people aren’t perfectly content with the life that they are leading, and certainly long-term travel is not for everyone but it seems like a lot of people aren’t willing to take necessary risks in order to go from content to over the moon. We faced the same deluge of questions when we told people we were going to go travel for a while. Even people who were supportive kept asking what we were going to do when we go back and how long we were going to go. I said at least a year and that was a long time and for once I was going to be ok with not mapping out my future and just see what happened. We decided that taking an adventure for the sake of having one was justification enough and I’m so glad we did. It’s really changed our entire outlook on life and how we want our future to be in ways that we never could have dreamed of. I’m really excited for you guys and am really happy to read that you’re making your happiness a priority! Steph thank you so much for your encouragement! I am continually so grateful for the blogging community and the support it offers to like-minded individuals. It really means so much to know that we aren’t crazy, and what’s more, that there are other people out there with the same aspirations! I couldn’t agree with you more about your comment on having the courage to go past simply feeling content and experiencing a joy in what you are doing. I always try to explain to friends and family that the point isn’t everyone needs to quit their jobs and travel the world; it’s about loving what you are doing. If you are lucky enough to choose your career, why spend it miserable, dreading Monday mornings week in and week out? Thanks again for your insightful and encouraging words! Congrats on your decision to embark on an indefinite journey of travel, adventure, and self-discovery. Some people in my family think that my husband and I are “unsettled” or “unhappy” because we take several trips per year. So I can imagine the comments we’d get if we decided to travel indefinitely! 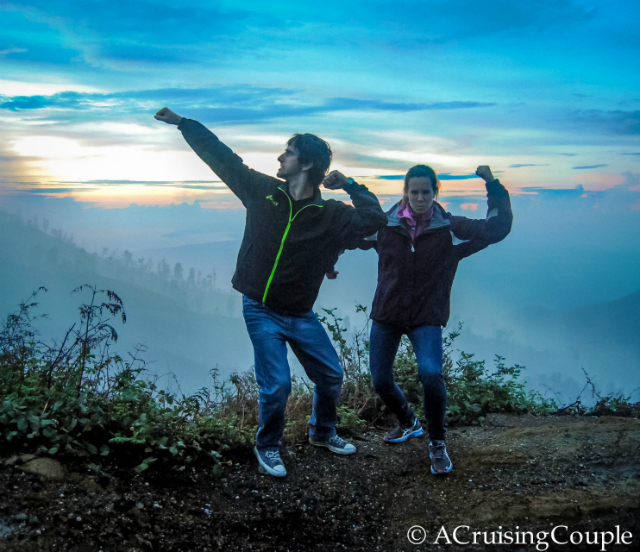 Some people just don’t understand that travel is what makes people like us truly happy – this is our passion! So trust that without doubts, fears, or hesitation, and continue to follow your hearts! Thank you Carmel! I definitely think more couples should travel together. It might not be true for everyone, but travel has certainly made Dan and I happier and continues to bring us closer together. It’s always nice to know others share our passion! Thank you Franca! We really enjoy following your journey, and you and Dale are certainly inspiring! It something we were asked a lot too in the beginning and even today we still get those questions. Gosh you’re still getting those questions? I guess we shouldn’t look forward to them stopping anytime soon then :-p I definitely find it difficult to let go of planning-even now I’m trying not to start micro planning every aspect of our upcoming trips! I’m sure, as you can attest, it’s extremely liberating to just let go a bit. And you never know what incredible opportunities are out there for you! Safe travels to Vietnam! I’m sure you’ll have an enriching time. Thank you! We are extremely excited to experience the country and the physical challenge! One of the best ways to roll is with “indefinite” plans :) Having the freedom to just go where you want, when you want, is completely liberating! Kudos to the two of you and here’s to the adventure of a lifetime! This struck a chord with me; Andrew and I have been on the road for a few months now and our thoughts are definitely turning towards how we can make our dreams of location independence reality and we have plenty of moments of self-doubt. It’s a hard path to take, but like you we know that travel is ultimately the right thing for us to be doing (even though we find it incredibly difficult sometimes). I look forward to following your journey. Amy, thank you so much for stopping by and leaving a comment! I find it always helps to know other people can sympathize with the challenges and excitement revolving around extended travel. It can just be so overwhelming, right?! I’m sure we’ll be able to learn a lot from each other, and look forward to seeing where traveling takes you both as well! This is perfect thing that I needed to read to make my decision more firm for opting for a life in travel! It is so difficult for people to understand my choice, I have been a travel junkie from a very young age as I grew up in Kenya, but never really had the guts to take it up seriously! I am currently saving up to pursue this dream! You guys have inspired me so much, thank You! I am currently living in Kenya, if you ever have plans of coming this side of the world, do not hesitate to contact me! My husband and I are heading back to Paris, so I appreciated all of your suggestions! We both love to travel, but despite what I’ve read on your blog, I don’t think we could afford to do what you guys do. I was wondering what your financial situation was before you embarked on your journey. Did you guys have any debt (student loans, mortgage, etc)? We have talked about living abroad for a year or two, but even then planned that I would probably need to work on a military base, and my husband could teach. The readership on your blog I’m sure helps, but I imagine took some time to build up! I have a cousin who travels frequently, but she and her husband had no debt (parents paid for school, cars, wedding, etc), and they have good paying jobs that can allow for that. Anyway, I think what you’re doing is really neat. I am expecting our first-born now, and we still plan to go abroad at least once a year, but I would love to learn how you guys managed to start and continue financially! Best of luck, safe travels, and I will continue to check back on your site! So sorry for the slow response – this comment got lost in our inbox somehow. But thank you so much for the note, and exciting you are going back to Paris! We were very fortunate in that we had no debt before traveling. I think this makes a huge difference. But we also taught English for two years in Taiwan and saved a lot of money during this time. This was a great way to travel as well as to have an extra safety net while traveling, which we definitely used! Now our blog has grown and we are able to support ourselves from working online, but actually not that much of it comes from the blog. And this is after blogging / living abroad for four years. From our experience talking to other bloggers as well, it seems like it takes time of working and blogging, saving money, and building an online business that you can run from anywhere in the world during this time. I hope this helps! Don’t hesitate to e-mail us for any other questions you might have and good luck! P.S. Congrats on expecting your first-born – I’m sure you will have many wonderful travel experiences together!